The Yamaha Genos has arrived and the speculation about what goodies the new instrument has to offer is almost over. Watch the demos now and listen to the great sounds of Genos at Yamaha’s dedicated Genos Concept website. Then, read our introduction to the instrument by UK demonstrator and product specialist, Ian House. The Yamaha Club archive, housed in our ‘Members Area‘, is updated on a regular basis and contains a wealth of material dating back many years (as well as new items pertaining to this specific issue). To gain access to this area after 3rd October 2017 use the password that’s published on page 4 of the latest edition of the magazine. The password is case sensitive so be sure to enter it exactly as shown. Playing Songs With Style: For an MP3 audio copy of the fished workshop please email glyn@yamaha-club.co.uk with ‘Never Can Say’ in the subject line. CVP – Up Close & Personal: Visit You Tube for the Stan Getz ‘Girl From Ipanema – 1966 Tropicana’ clip referred to by Richard Bower. Penny Pieces: Hear the theme from Brief Encounter on You Tube. Then download Penny Weedon’s performance of her simplified arrangement, ‘A Brief Rachmaninov Encounter’ for keyboard and Clavinova. An introduction to the Yamaha Clavinova CSP Series digital pianos. The launch of the Yamaha Genos Digital Workstation. Music Finder Software: The latest title to be added to the Easy Keyboard Library Music Finder software collection is… ‘Disco’. In our letters section, club member Dave Porter suggested a source on eBay for Replacement ear-pads for Yamaha RH-5Ma headphones. 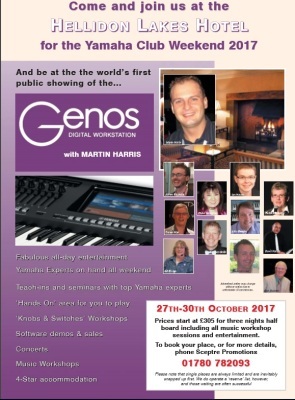 An amazing weekend of music and demonstrations that’s a must for the Yamaha keyboard and Clavinova enthusiast. Come to the Hellidon Lakes Hotel in Northamptonshire and meet the stars of Yamaha UK and Yamaha Club – including Martin Harris, James Sargeant, Ian House, Richard Bower, Chiho Sunamoto, John Beesley, Jon Smith, Steve Marsden, Daniel Watt, David Harrild, Gill Eccles and your host, Glyn Madden. For more details about the club’s annual event click here. Yamaha Club Magazine is produced to a high print standard in glossy full colour. A sample copy, however, is available for you to enjoy. Yamaha Club Magazine is an independent publication for Yamaha home keyboard, organ and Clavinova digital piano enthusiasts, based in the UK and working in association with Yamaha Music Europe GmbH UK. 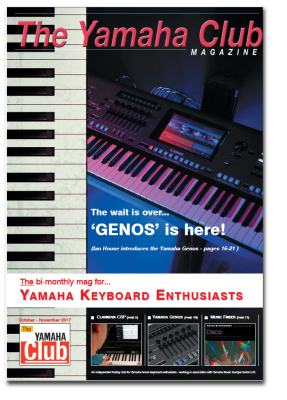 The Yamaha Club Magazine was first published in 1995 by top Yamaha UK Demonstrator / Product Specialist Glyn Madden with the intention of supporting amateur home players of Yamaha portable keyboards, organs and Clavinova digital pianos. Although the Yamaha Club Magazine is independently owned, Yamaha UK lend their full support to the project and, through the contribution and encouragement of the UKs finest Yamaha players, teachers and technicians, almost 4000 subscribers now benefit from this invaluable resource.